Men of St. Paul-- you're invited to join us Wednesday, October 3, for our monthly men's Bible Study at the Lamplighter Restaurant in Sebewaing. We'll gather for a Bible study from 7:00 - 7:30 a.m., then those who are able are invited to stay and enjoy breakfast and fellowship with men from our Thumb West circuit. Men of St. Paul-- you're invited to join us for our monthly men's Bible Study at the Lamplighter Restaurant in Sebewaing. We'll gather for a Bible study from 7:00 - 7:30 a.m., then those who are able are invited to stay and enjoy breakfast and fellowship with men from our Thumb West circuit. 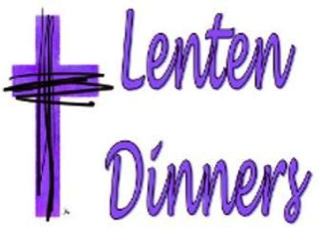 The LLL will be continuing their Lenten dinners before each of our midweek Lenten serv ices. These delicious meals will be served each Wednesday from 5:30 - 6:30 p.m. in the school gym. The monies raised will support the many ways that Lutheran Hour Ministries is reaching out to the world with the Gospel, including their weekly broadcast of the Lutheran Hour, and many others that go on daily right here in Michigan, across the country, and around the world. Please check the bulletin each week to find out the menu for the following Wednesday. For more information about the work done by the Lutheran Laymen's League and Lutheran Hour Ministries, go to www.LHM.org. Remember, guys, the next LLL Men's Bible Study at the Lamplighter Restaurant, Sebewaing, is Wednesday, February 7, at 7:00 a.m.
We'll gather for a Bible study from 7:00 - 7:30, then those who wish to do so can stay for breakfast, as well. Coming in February— Man Up! We have a new Bible Study for men coming up starting in February: Man Up! Based on the book by Pastor Jeff Hemmer, we’ll dig deeper into what God intends for us as men. Don’t worry— this is not your wife’s book club. We’ll be using some interesting activities (nothing embarrassing, I promise!) to illustrate some of the main points from the book. In these six sessions, starting February 11, we'll look at what it means to be a man from the perspective of God's Word, what's standing in our way, and, most importantly, we'll turn our attention to Jesus Christ. What does it mean to be a man? Sacrifice. Man Up! doesn't tell you to take down the feminists or reclaim your God-given role and rights. Real masculinity starts with giving of yourself for the good of those around you and in your care. It's counter-cultural—and it's exactly how God designed biblical manhood. This book is a call to fix your eyes and your hope on the Man up on the cross and to find in His selfless sacrifice the perfect example for manliness in our self-indulgent, self-centered society. That's where Man Up! really stands out in the crowd. Don't pick up these pages expecting to find an ideal man you should strive to be. This book is anchored in a different ideal. In the person of Jesus Christ, God became man. What Adam lost in his rebellion, Jesus restored in His Incarnation. Jesus is the perfect man. His example sets the paradigm for perfect masculinity. But more importantly, His sacrifice obtains forgiveness and mercy for the rest of us men who are bound to fail in this God-given task to be good men. Men in all stages of life will appreciate this refreshing perspective—whether you're searching for footing in this crazy culture, seeking a godly relationship with your wife, or looking for guidance on raising children. Remember, guys, the next LLL Men's Bible Study at the Lamplighter Restaurant, Sebewaing, is this Wednesday at 7:00 a.m.
We'll gather and be led in a Bible study by Pastor Thom Garrison from Bach & Kilmanagh, from 7:00 - 7:30, then those who wish to do so can stay for breakfast, as well.